‘’Access prohibited’’ states the sign in big bold capital letters, on Pontoon B at the Birgu Waterfront. Behind the security-controlled locked gates, rows of superyachts adorn the skyline. The iron barriers act as a stark division between the worlds: super rich, and us mere mortals. I peek around as I nervously approach the gates, yet nobody seems to look my way twice as I stroll up, half expecting to be told to leave before I have even arrived. In the distance, Luc, second captain of our luxury charter, Miss Money Penny, owned by Azure Ultra, clocks my nervous disposition at the harbourside and wanders over to let me through. Greeting me in the utmost professional manner he guides me towards the glistening boat. 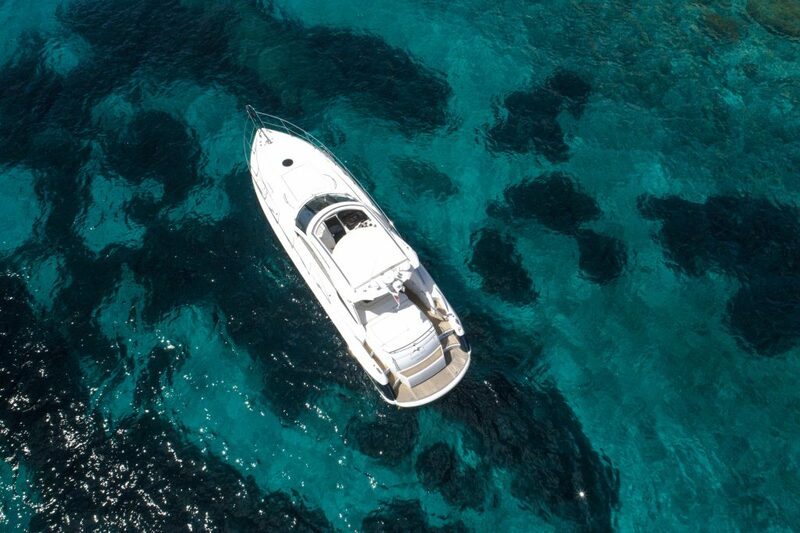 The day has an ethereal charm about it, the sky is a picture-perfect cornflower blue and tranquil waves slowly lap against the surrounding boats. As I remove my sandals and step on board, Luc hands me a fresh mint and lemon water while I wait for my friends, and introduces me to our captain for the day; Gary. 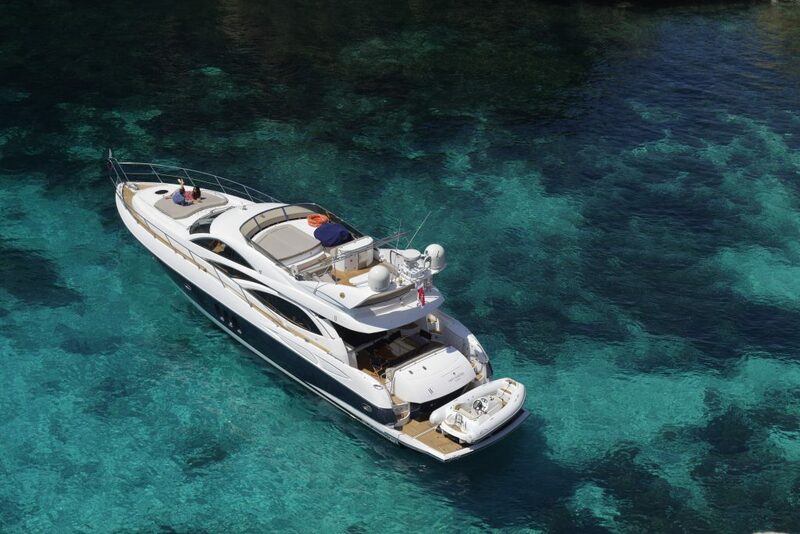 Miss Money is a Portofino 46, Sunseeker luxury boat (the same brand that features in four of the iconic Bond movies!) set with a cool price tag. I acknowledge to myself today is just a small sample of how the world’s wealthiest live. My three friends appear, equally stunned by the surreal reality of our private superyacht charter. After all, things like this don’t happen every day. Once everyone is aboard, we all gather round on a leather sofa at a crisp white linen dressed table and listen attentively as Gary explains the safety protocol for our harbour cruise. Afterwards, Luc takes us for a quick tour. A double bedroom, a twin bedroom, immaculate en-suite bathrooms, and a fully functional kitchen are neatly tucked in, just a few steps below deck. The entire boat is pristine and adorned with satin cherry wood décor where every tiny attention to detail is considered. Back up above, we take our seats as Luc pops open a bottle of champagne as we sail out of the harbour. Captain Gary gives us the lowdown on the fellow superyachts in town, and hints at who may own them (currently attracting much speculation, Kingfisher remains impounded in the harbour). Despite living on an island, all too often we are caught up in the every day routine of eat, drive to and from work, sleep, repeat to acknowledge the beauty in Malta. It’s at that moment I realise I have never actually seen Malta from a sea vantage point of view (unless the Gozo ferry counts). Thousands of seafarers have entered Malta in this manner for centuries, yet we’retoo busy looking from the inside out. We are all too aware Malta has a checkered nautical past, the shadows of which we live in every day. Sailing out of the harbour, Gary describes the pinnacle landmarks around us, Fort St Angelo to the right, and a little further back, Fort Rinella. We venture around the industrial shipyards of Palumbo and Virtu Ferries before leisurely meandering past Valletta Waterfront. Unusually, no cruise ships are docked today, allowing us a clear view of the iconic colourful doorways and every day harbour life. With the wet spring we have endured, vibrant green tones from Barrakka gardens frame the picture. Meanwhile we all start nibbling on a bountiful Italian platter whilst sipping our bubbles. Conversation flows as readily as the drinks andeveryone relaxes as we settle into the cruise. 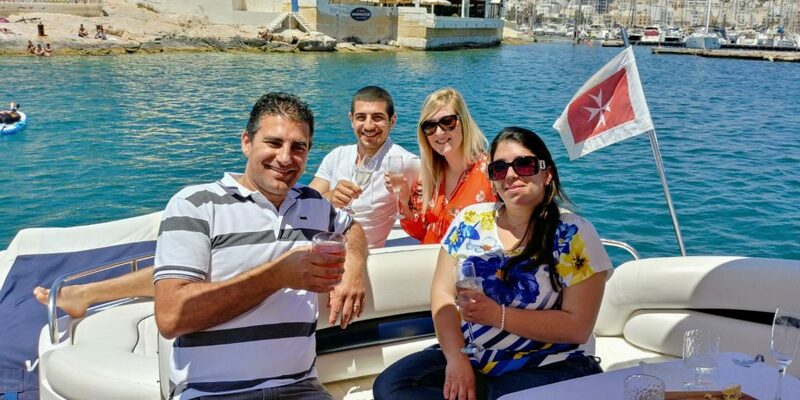 Briefly we venture into the open water before making a U-turn into the Valletta-Sliema harbour. Just past Manuel Island, a stone’s throw from the embassies, we drop anchor to enjoy our lunch. Nothing seems too much for Luc as he fetches us drinks and then a steady stream of desserts. We then explore the boat some more, catch some rays and take in the beauty of the coast. Malta is simply breathtaking viewed from the sea. Azure Ultra have three other motor yachts in their fleet- Senda Dos, Don’t Ask, and Mio Amore (the largest yacht, which entertains 12 people). Gary informs us his personal favourite to sail is Senda Dos. When questioned why not the biggest boat in the Azure fleet, Gary reveals ‘’For me,the fun in sailing is lost the bigger the vessel becomes. As you lose close contact with the sea, it feels more like a small city over the waves’’. After being fed and watered, we sail back, darting along the waves back to the mooring point. 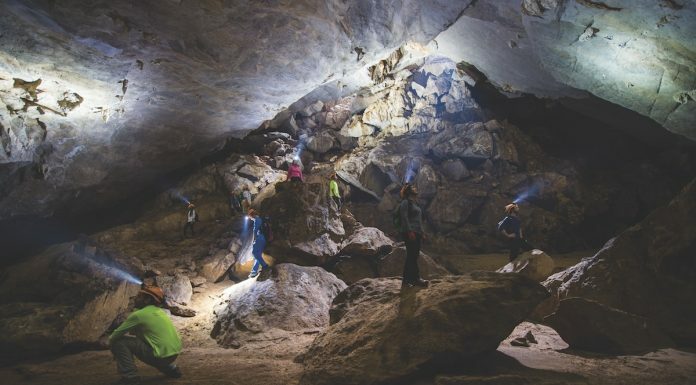 The experience is unforgettable and like nothing any of us have experienced before. We leave smiling like Cheshire cats, not quite ready to step back into our regular lives. 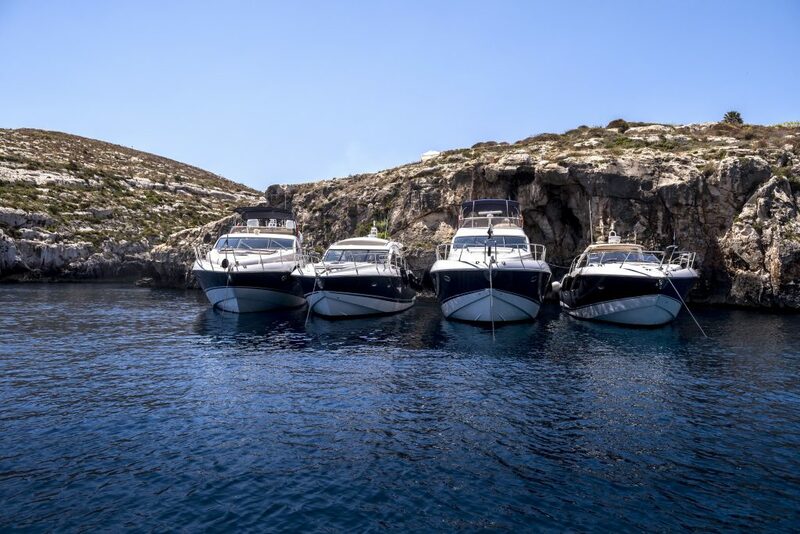 Azure Ultra is a luxury yacht charter company, based in Birgu harbour that specialises in personalised itineries around the Maltese archipelago and beyond. 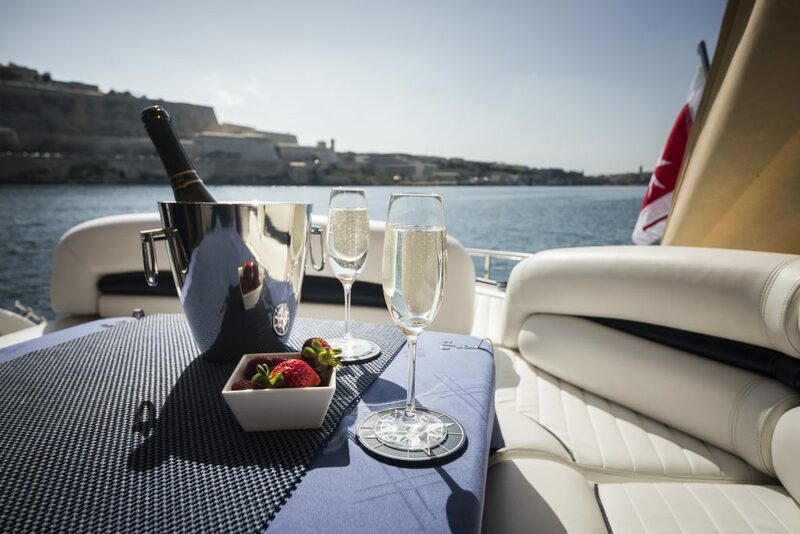 The brand tagline is ‘Beyond Ordinary’ and they aim to offer a custommade, exclusive charter each and every time. They take great pride in award-winning customer service. 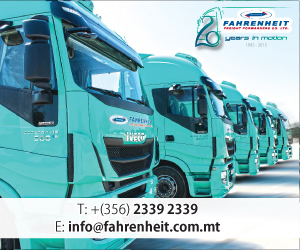 All the staff are highly skilled, in uniform, and their first priority is the client. 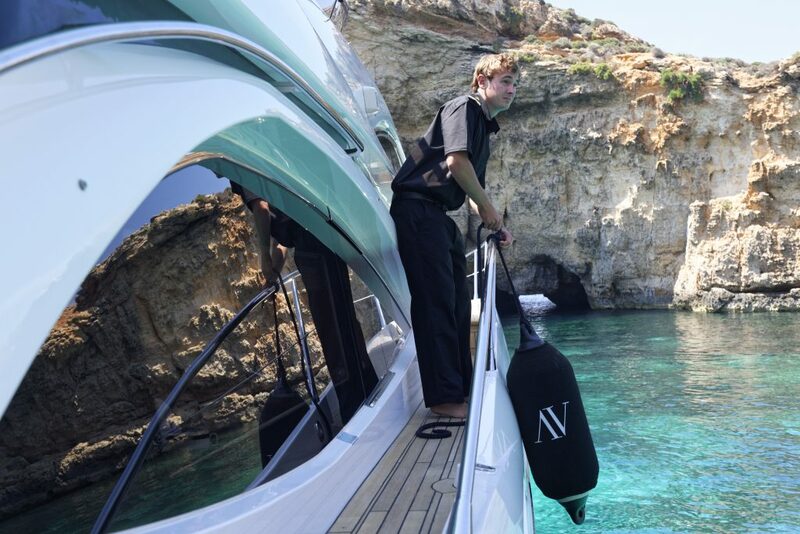 Every yacht charter includes a captain and steward or stewardess. It’s clear they invest in their staff – one of the new captains, Luc, joined as a ‘newbie’ a few years ago and has worked his way up to the top!